Welcome to Allison Crutchfield's coming out party. Oh, sure, she has been around in Swearin', Bad Banana, and P.S. Eliot, but Tourist In This Town marks the beginning of her new solo career. And what a beginning -- mature and assured without being glossy, loaded with pop smarts while retaining the passion and attitude of her indie rock efforts. The melodies are interesting and varied, and Crutchfield's vocals are note-perfect. Yeah, it is a bit of a breakup album, but the adept songwriting and superb delivery keep the listeners focused on the song, not the background. And at the end of the day, there is promise and hope rather than despair. And speaking of promise and hope, we think we're going to enjoy the new Allison Crutchfield for a long time. Tourist In This Town is out now via Merge Records. I had trouble getting going today, but "Numb" from French producer Joakim saved the day. I'm upright with a spring in my step. So the least I can do is share the goods with the rest of it. And note that Joakim's new album Samurai will be out on March 17 via Tigersushi. Have we not discussed Fazerdaze before? Our apologies, we must have been keeping it as our little secret, and it isn't nice to have secrets. But this is a good time to change tack, because Auckland, New Zealand's Amelia Murray is about to make some lovely noise, and earn some well-deserved praise, for her upcoming album Morningside. The album will be released in early May via Flying Nun, and we'll have more on that at a later date. For now, have an introduction with the sparkling album track "Lucky Girl". "It Doesn't Matter" is your introduction to London band Secret Cameras. It is the second single from their upcoming debut EP. The tune has an ambitious scope and reveals a band with talent and confidence. Bandcamp for "It Doesn't Matter"
The Eversons were a New Zealand band, and now they are a British band. Impeccable timing, boys -- just in time to try to break into the European market while Brexit trashes everything. So we may not ask the band for career tips or stock market plays, but we are big fans of the music. 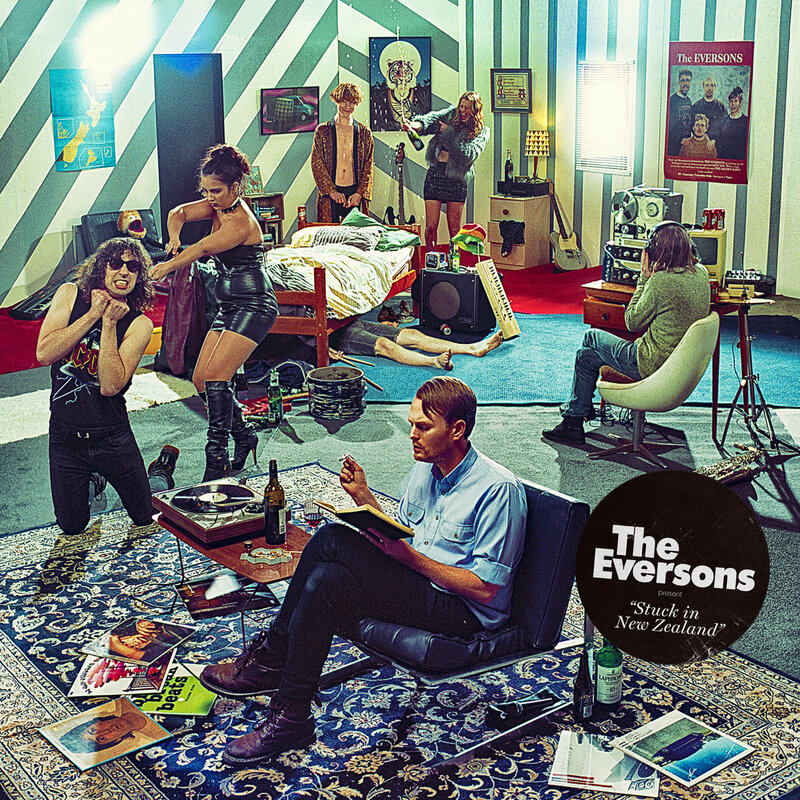 On their recent album, Stuck In New Zealand, The Eversons fashion indie rock with plenty of melody and hooks, beats that invite dancing, and a lot of humor. Yes, they really are funny, and they have the kind of humor that may have you asking "are they really singing that? Awesome!" And if the humor has a bite, you can always pretend that it is about someone else. The style covers modern indie rock, '70s classic rock, a bit of glam, some jangle and bubblegum. The two lead singers occupy their roles in the stories with conviction. This album is excellent rock music, and a lot of fun. It is available on Lil' Chief Records; see the Bandcamp link. Archivo Pittoresco is a treasure box of an album, and a strong argument for embracing variety in life. The work of Portuguese artist Lula Pena, the lyrics are sourced from various writers, as well as Pena herself. She sings in her native language, French, English, Spanish, Greek, and Italian. Pena is accompanied only by an acoustic guitar, but with her gorgeous voice and impeccable phrasing, anything else likely would be a distraction. The songs are gentle and flowing, including folk, French chanson, fado and bossa nova styles, among others, but all elements yield to Pena's inspired interpretations. Pena has written that the album is based on 19th century landscape painters. With my limited language facility, I confess to be a bit adrift in following that part of the plot, but my deficiencies in that regard to not affect my appreciation for the music. Archivo Pittoresco is out now via Belgian label Crammed Discs.